The following bonus and the two missions are available from 2 December at 06:00 to 5 December at 06:00 CET (UTC+1). 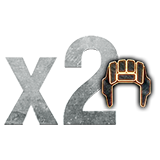 Earn 5,000 XP over any amount of battles. Complete the mission ‘Get your Credit Chest’ six times. Finally, some credits mission. Well done wargaming.